Does it look like I enjoy performing? I thought so. My brother Tim Pippus asked his photographer/friend, Bob Friesen to come to the show on the weekend and get some shots of me doing what I do. Bob's day job is as the news photographer for the the local newspaper in Mission. 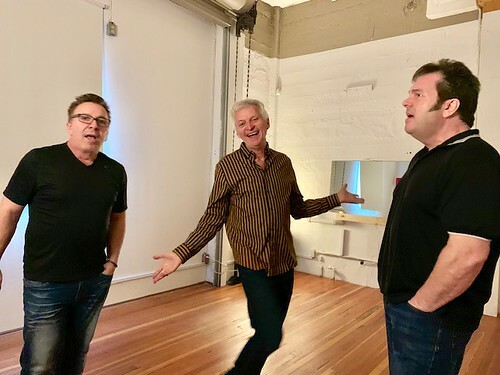 The Elvis medley features all three of us male singers competing to be the best "Elvis". It always gets a laugh. The photo on the top is me doing "The Great Pretender", originally a hit for The Platters. The guitarist with the Relive The Music band is Kim Mendez. As a fellow guitarist, I particularly appreciate her approach to the craft. She's hardworking, methodical (always practising), thoughtful and precise in her playing. She brings five or six guitars to every rehearsal, every gig. Her pedal board has so many choices, another indication of her attention to sonic details. 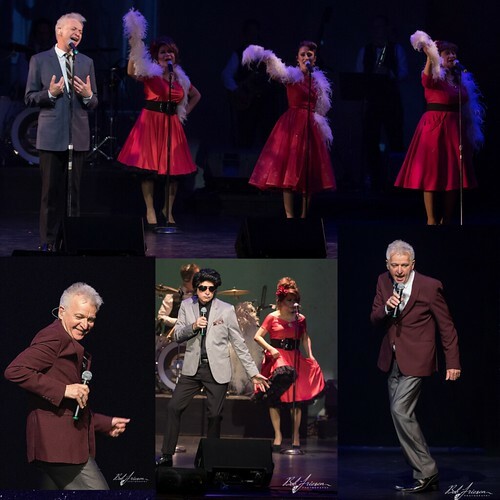 Photo by Bob Friesen, taken this past weekend at The Clarke Theatre in Mission. When I got hired for this gig, I told them I don't sing harmony and I don't do choreo... But that went out the window early on. I'm not good at it - thank god I know how to sing lead - but I do what I can. Here we are getting our Beatles' medley in shape. Next show is on Saturday at the Bell Centre in Surrey. Email me to get in the draw for two tickets (value $49 each)! We rolled into Vernon on Friday afternoon, and performed that night for about 450 people at the Vernon Arts Centre, close to capacity. This was our fourth show (the first three were last weekend on the Island). We've moved things around in the second set to make costume changes easier. Added back one of the songs cut earlier for time. Still more fine tuning to do, but it's getting tighter. The next show is in two weeks in Kelowna. Only about 30 seats still available in the 850-seat venue! People are loving the concept, and now that we have performance photos and promo videos that will help sell the show as well. Lower Mainlanders, we're at the Surrey Bell Centre on Saturday April 6th. See my shows page for all future dates. Our first three shows last weekend on Vancouver Island were a success. Near capacity theatres, standing ovations, and the show is now tested in front of audiences and being fine tuned. Next show this weekend in Vernon. Only balcony seating left. In the photo, left to right: Steve Hillis, Andrew Slee, me, Luisa Marshall, Zenia Marshall, and Tota Mendez. Behind us are the five-piece band. We also have two dancers and we travel with our own soundman. I'm singing lead on a dozen songs currently including Dion's "Runaround Sue", Jerry Lee Lewis' "Great Balls of Fire" and I WAS doing "Papa's Got a Brand New Bag" by the Man himself, Mr. James Brown, but it was cut for time, dammit. I've started a petition to get it reinstated, the band is totally onside with this. I'll keep you updated. I'm so grateful to Steve and Luisa Marshall for selecting me from who knows how many applicants to be part of this troup. We have so much fun on and off stage. This show will go on for a long time, I predict. See my "shows" page for dates. Well this is different. 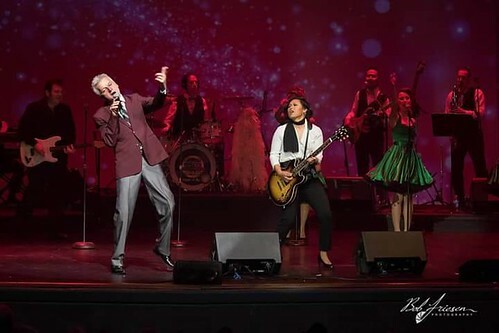 I answered a Craigslist ad recently looking for a male singer to join a troupe to perform 50s and 60s rock n' roll - and I got the job. Five shows are confirmed for March (see the 'shows' page). Promo photos being taken this month. 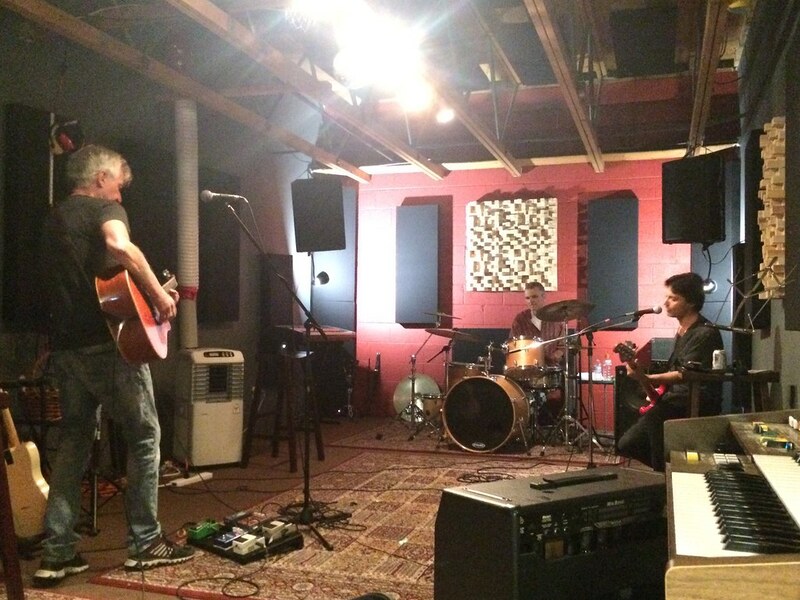 Rehearsals in January. There's a five-piece band, three female singers, and two male singers. All the venues are 500+ seat theatres. A full production, with video projections, costumes, dancing and lots of singing. I'll be solo'ing on everything from Paul Anka's "Diana" to James Brown's "Papa's Got A Brand New Bag" and many other iconic tunes. Let's get this party started! Last night was pretty special. Forty people bought tickets at $50 each for the Jane Siberry concert I was hosting. I played a three-song opening set. Jane is a real artist, she follows her artistic vision wherever it takes her. You can read about Jane's life in music at her page. I'm riding the train to Toronto, leaving a week from Friday as part of VIA's "Artist On Board" program. I made the trip a few years ago and it was a mix of fun, boredom, iffy Wifi, time for reflection, and plenty of conversations to help pass the time. There's nothing like taking the train across this country. The deal is that I play three, 45 minute sets on the four-day trip, including a couple of sets in the Vancouver and Jasper train stations. In exchange, I get a cabin for two, and three meals a day. Plus a view of the country that can't be beat. I'll be in Toronto for a week mostly playing tourist but also hitting an open mic or two, maybe doing some co-writing/recording as well. Any Toronto friends reading this - I'll be there, staying at a Air BnB in Kensington Market from Oct. 17th to 23rd. Hit me up if you want to get together! A meal, a movie, a jam session, I'll be around. Then it's back to Union Station for the ride home. This gig is unique. It's a moving house concert, no amplification, just me and my guitar (and my harmonica and my stories), three shows a day. I've got lots of originals, covers, Canadiana covers too. And I'm working up a list of train songs. Coming back, I play in the Winnipeg train station and Jasper again (beautiful station and location, by the way). The Winnipeg train station! My first-ever memory occurred there. I was two, maybe three years old, and I was frightened by the steam coming out from the side of the train as I was walking on the underground platform with my grandmother. I reached up and grabbed her hand in fear and was instantly calmed. And that moment has stayed with me all these years. I host house concerts from time to time, usually once a month. I've hosted Oh Susanna, Kele Fleming, The Colorifics, Illiteratty, Wanda Nowecki and a few more over the past year or so. The next one is going to be extra special. 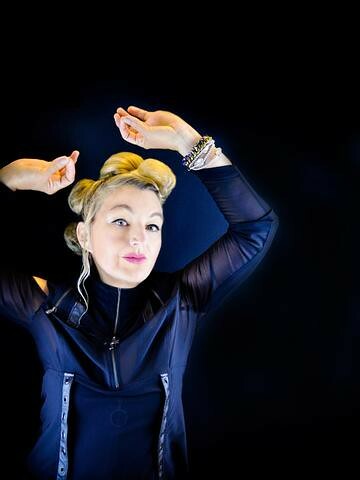 Jane Siberry will be playing on Sunday Nov. 4th at 7:30pm (doors at 7pm). She's a delightful and original artist and I couldn't be more thrilled to play host. Have a look at her Wikipedia entry. Jane has led a fascinating career spanning several decades and has worked with many notables including k.d. lang, Joe Jackson, Peter Gabriel, Suzanne Vega... so many more. The photo of Jane was taken by Gary Eden. Flickr makes it look like I took the photo. Nope. Not me. Future concerts that I'm hosting include: James Gordon (Nov. 8), Joe Charron (Dec. 1), and Sheri Ulrich (Jan. 25). Get in touch for info and tickets! Only 40 tickets sold per show. 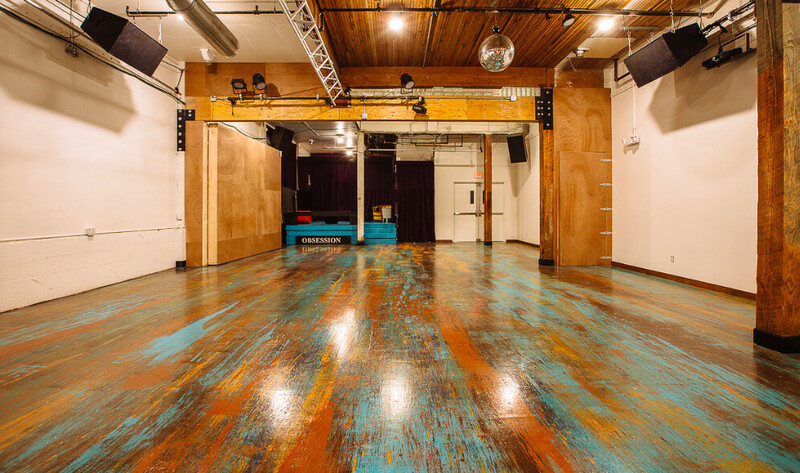 We have Sunday afternoons booked at Red Brick Rehearsal Studios. Working out new tunes, tightening up existing tunes. A good way to spend a Sunday afternoon. Red Brick is owned by my son Jake btw. Find him on Facebook! Here is a new, live performance video, recorded mid July and released today. "Let's Legalize It" is a song that talks about what would happen if we legalized all drugs, worldwide. There would be "no drug lord profits, no overdose" for one thing. And the number of people dying would be drastically reduced. This is the first of three videos being released from the July session. In the next couple of weeks, I'll be posting "Seen A Ghost" and "Whole World Watching". All three videos are directed by David Manuel with Scott Rogers recording and mixing sound. Joining me are Marq DeSouza (bass/vocals) and Wes Skakun (drums). So many good memories from the last six days of shows and workshops. It started last Tuesday afternoon in Nanaimo at an outdoor event. Well attended, good listening audience, beautiful location. Then on to Char's Landing in Port Alberni for my Songwriting Workshop. And the next night an equally well-attended workshop, this time the subject was performance. Thursday night, again at Char's Landing was our Rock and Roll Dance Party. Always a fun time playing these dances. This was a Benefit for the Arts in Port Alberni. Friday and Saturday the band was at the Lasqueti Hotel. We also played an afternoon set at the Annual Firefighters' Picnic. Most of the Islanders show up for this get together. As always, when I travel out of town, the memories are not just musical ones, it's about the people you connect with along the way. Next tour will be in October. Travelling on the train to Toronto and back, part of VIA's "Artist On Board" series. I'll have time for a house concert or two in Toronto, so if you know of any hosts, get in touch! 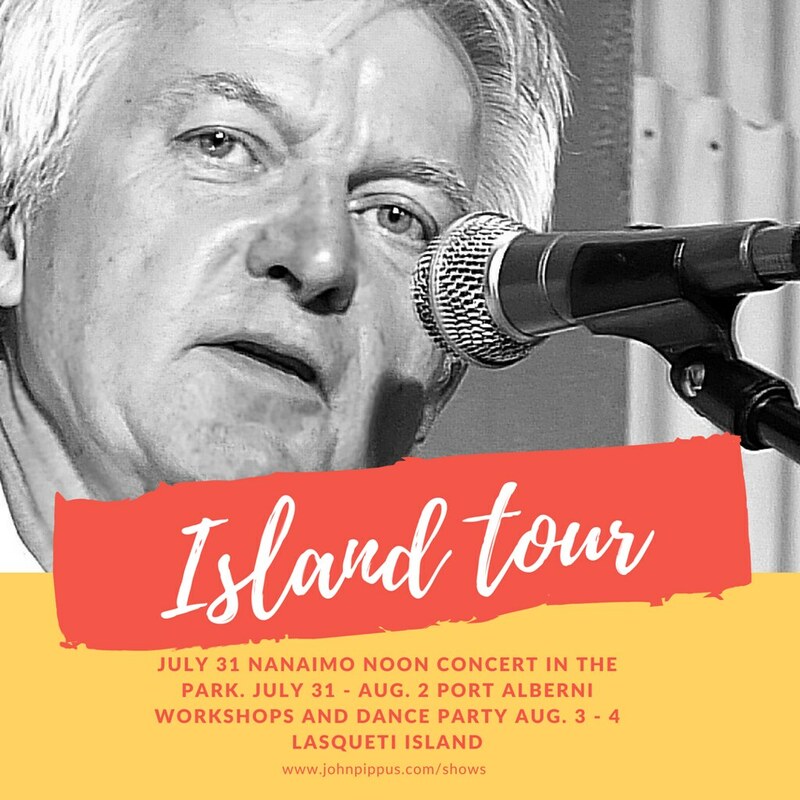 Here's an article from the Alberni Valley News describing the upcoming workshops and dance party at Char's Landing in Port Alberni next week. Whether you're a beginning songwriter or a pro, like it says in the story, "In both cases, you're sitting there facing a blank piece of paper. You're starting over every time." Workshop description and ticket info on my "shows" page. I'm getting ready to head back to Vancouver Island at the end of the month. I've got an interesting mix of gigs and workshops lined up. First up is a noon hour concert in Sutton Maffeo Park in Nanaimo. This will be a solo/acoustic show, part of a summer series presented by the City of Nanaimo. That evening I'll be in Port Alberni presenting my Songwriting Workshop at Char's Landing. The next night, same venue, I'll present The Art Of Performance - a workshop I've designed to teach all aspects of what to do when you're faced with an audience. Then Thursday Aug. 2nd I'll be joined at Char's by Marq DeSouza (bass/vocals) and Sean Keough (drums) for a rock and roll dance party. On Friday and Saturday nights I'll be on Lasqueti Island, along with Marq DeSouza and Wes Skakun (drums) for a two night stand. You can find details and links on my "shows" page for all events. It took awhile, but I finally found a big, empty space to shoot three live performance videos in. The Beaumont Studios on West 5th in Vancouver. The trio (Wes, Marq, and me) will be doing three of my songs - "Let's Legalize It", "Whole World Watching" and "Seen A Ghost". David Manuel will be doing the video side of things, Scott Rogers will be recording audio. Two live passes of each tune, add in some B-Roll. That will do it. Coming to my You Tube channel by August! 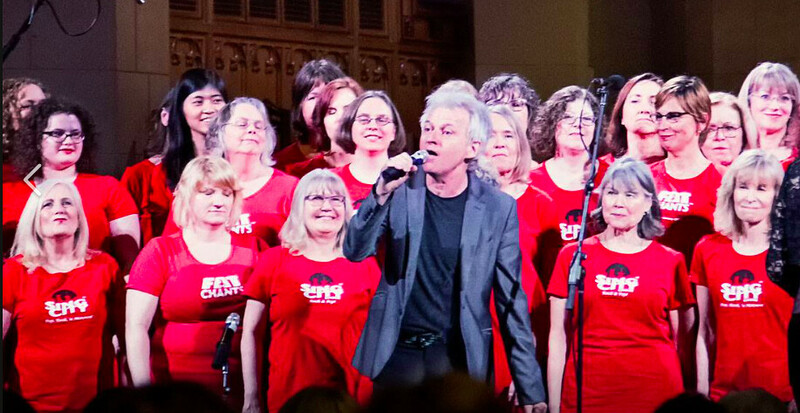 Reg Ham, a Vancouver photographer sent me a few shots he took last year when I was guest vocalist with Sing City Choir. We did Bob Seger's "Old Time Rock and Roll" and one or two others. What a rush fronting 100+ voices! Hope I get to do that again, you feel like you're strapped to a jet engine. It's become one of our favourite venues to play in the city. I'll be joined by Marq DeSouza on bass/vocals, and Wes Skakun on drums. 9:30PM to 12:30AM. 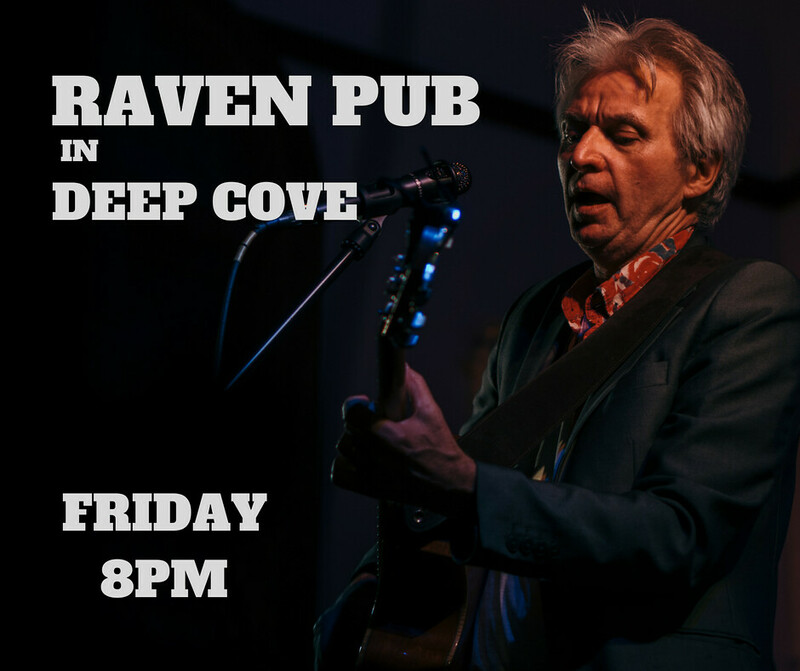 I play at The Raven Pub in North Van tomorrow night. It's a gig I've been doing four or five times a year for the past few years. It pays enough (plus dinner and drinks) to do it as a duo gig so that's usually how I do it. Lately, I've been playing it with Jean Savoie on bass. It's always a good crowd, the staff are friendly, and it's a pretty light load as far as pub gigs go. We start at 8 and are all done at 11PM. I do have to bring my own P.A. so there's that, but it's worth it when you add it all up. Maybe you didn't notice, but I sure did. My website was down for a couple of weeks due to changing over from one provider to another. Anyway, I won't bore you with details on that. So meanwhile, I've been busy booking some summer dates including an outdoor carnival on the Downtown East Side, a house concert at a blueberry farm, two nights on Lasqueti Island, some more kids shows at the Roundhouse Community Centre in Yaletown. Other dates too, with and without the band. Duo gig with Jean Savoie at The Raven Pub on April 6th. Trio gig at the Libra Room on Commercial Dr. on April 20th. With Jean Savoie (bass) and Sean Keough from Port Alberni on drums. A couple more gigs at the Roundhouse in April too. Playing kids songs! I love it. A tough crowd these 4 to 6 year olds (and some younger and some older, plus their parents) but when it's working and we're all grooving (or shaking our sillies out) there's nothing like it. Music and groove is the universal language after all. And if that isn't enough variety, I'll be playing a three-hour cover gig with a new duo partner, Andreanna Pelehos at Steamworks Brewery on the last Thursday in April. One last note. I had an inspiring (and humbling) time last weekend going to the various clubs around town that were showcasing various acts, all part of Juno Weekend. So much great talent out there. And all Canadian. Jesse Roper from Nanaimo was ripping it up at the Roxy. Jim Cuddy (Blue Rodeo), Ed Robertson (Bare Naked Ladies), Barney Bentall and his son Dustin were fronting an excellent band (that included Ford Piers and Paul Rigby) at the Imperial. Toque packed the Railway on Saturday night with three hours of non-stop Canadian covers. Their frontman, Todd Kerns, plays bass with Slash. The bass player is the drummer with Shania Twain. These guys know their stuff. What a treat. Keep on rocking. That's what I intend to do. I don't like the alternative. What a time that was... I took the ferry over on Thursday and drove about twenty minutes to Brentwood Bay. It's a pretty town located on the Saanich Penninsula, right near Butchart Gardens. The first stop on this latest Island tour was The Brentwood Bay Empourium. It's a medium sized licensed coffee shop. Just under 20 people had bought $20 tickets and they started arriving about half an hour before show time. As I started to play I thought I recognized my former boss in my previous incarnation, working at Global TV as a newsroom video editor. Sure enough it was Ian Haysom, along with his wife Beth and two friends. I played two 45-minute sets, told stories along the way and had a fine time. As I've said many times, house concerts, theatre settings - any gig where there's an attentive listening audience is what I (hell, and any songwriter) like the very best. 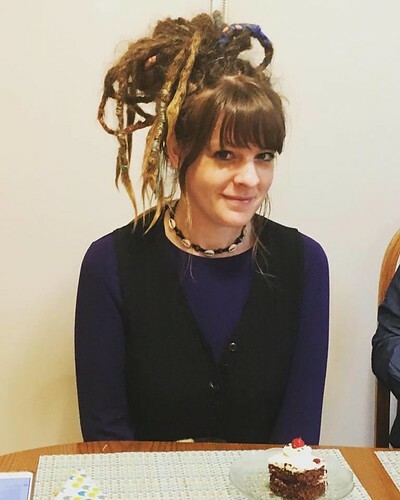 I've got a rock band and that's fun too, but it's a different kind of connection. More viseral. That night, I stayed with my friend in Oak Bay, Maureen C. We stayed up way too late drinking wine and playing our favorite finds on Youtube. She turned me on to Cat Empire, and I introduced her to Selah Sue and Triggerfinger doing "Mercy". Friday, I drove up to Nanaimo and met up with Kendall Patrick and her band for the gig at The Corner Lounge. We set up early then went back to Nico Rhodes house (keyboard player and chef deluxe) for dinner and dessert. Kendall lives in Nanaimo and writes catchy songs in the Ani DiFranco mode. (She's got a line about "Harry Styles makes me feel like a cougar", which I love). The gig got going shortly after 9PM. I started off solo to a handful of bar regulars who were mostly indifferent. Except for this one woman at the bar who turned around to listen and stayed that way. More people started arriving. I invited Kendall and the band to join me, as planned. We did half a dozen of my songs, then a few covers. I turned it over to Kendall and the boys (Caleb Burness on drums, Nico Rhodes on keys. By 11PM it was my turn to come back and blast through a whole lot of cover tunes. By now the small bar was packed. Brian, the owner, worked the door. The dance floor was hopping. We played Stones, Etta James, CCR, Chuck Berry, Springsteen, non-stop to 1AM. Along with an encore or two. Then we hit Mambo's for some late night pizza and laughs. Saturday I got some late breakfast then met Bill L. at the dock to take me across to Protection Island. This was my fourth time playing on P.I. People get around on golf carts and everybody waves. I soundchecked in Moira L's living room along with her 5-year old grand daughter and her stuffed animals. Debbie, a long time friend of Moira's was staying there and she made a delicious dinner. Then people started arriving around 7PM. 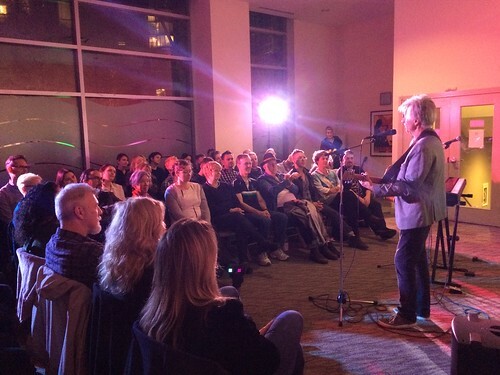 Much like Brentwood Bay, I playd two sets, did my songs, played a couple of sing-a-longs and just had a fabulous time. After a pancake breakfast (that I made), Bill took me back to Nanaimo - just a ten minute ride by power boat - and I drove the hour or so it takes to get to Port Alberni. This was for an early evening concert (sold out by the way) with the elementary choir from Ecole Alberni. The choir director, Madame Megan Reddick and I had never met before Sunday, but we had worked out the details online. We did a one-hour rehearsal and the kids were gold. Hearing their angelic voices singing my words and my melodies blew me away. The concert went well. A big surprise was that I sold a lot of CDs afterwards. I figured the audience (proud parents and grandparents mostly) was there for kids not me, and the CDs would just sit there. But it was the kids who wanted a memento of the night, as it turned out, and what parent could refuse? So that was a bonus. As I've said before, this is what I would be doing if I only had limited time left - which I guess I do, come to think of it! Writing songs, and playing them for an appreciative audience. Thanks to John C. Maureen C, Kelly N., Brian B., Kendall, Caleb and Nico. And to Moira L, Deborah S., Char, Megan, and all the kids from Ecole Alberni for making this trip such a good one. Just finished a busy weekend. 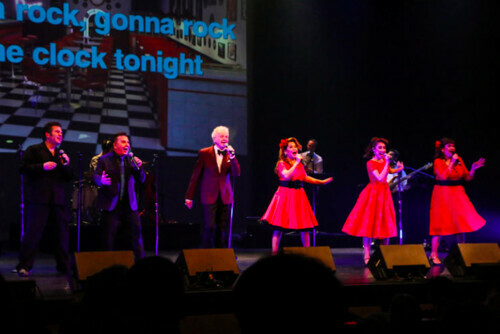 Two dates on Vancouver Island - a rock and roll dance party at Char's Landing in Port Alberni, followed by a concert the next night in Duncan at the Chapel at Providence Farm. But wait, these shows were followed by a three-hour kids' show on Monday at the Family Day event at the Roundhouse Community Centre here in Vancouver. You gotta admit I'm versatile, if nothing else! Time to regroup, with the rest of February having only one band show on the schedule, an overnight visit to Nanaimo to rehearse with Kendall Patrick's band, and then a short family visit to Los Angeles before heading back to the Island at the start of March. This time I'll do a solo show at The Brentwood Bay Empourium on March 1st, then Friday night in downtown Nanaimo at the Corner Lounge with Kendall Patrick and her trio (Nico Rhodes/piano, Caleb Burness/drums). We'll do separate sets but join forces with a rocking set (or two) to finish off the evening. Saturday I'll be returning to Protection Island (accessible only by a walk-on ferry if you don't have your own boat) for a house concert. 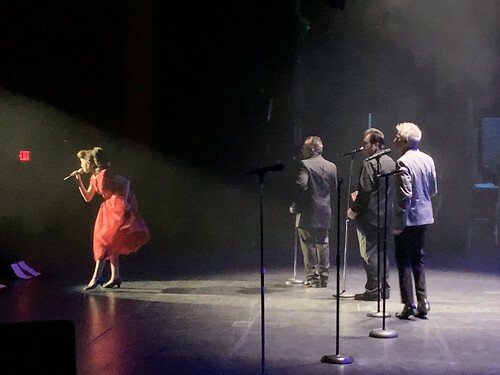 The tour wraps up in Port Alberni with a special early evening concert. I'll be performing with the choir from Ecole Alberni Elemtary School under the direction of Megan Reddick. The kids are learning some of my songs, I'll do some solo, and they'll do a couple on their own as well. Ticket info, start times and all that good stuff on my "shows" page. There's this 100-seat venue on a farm just outside of Duncan, BC. (For you out-of-towners, Duncan is midway between Victoria and Nanaimo on Vancouver Island). I'm going to be playing there in just under a month (details on my "shows" page) with Marq DeSouza backing me on guitar and vocals. And just for fun, we're adding cajon to the mix. (A cajon is that little box you sit on and tap with your hands, traditionally played by hippies on the beach). Drums were Marq's first instrument and although he had never played cajon until last week, he's a natural. So we'll do a harp-and-cajon number, and he'll back me on several tunes with the cajon and a 'porch step', which is an amplified foot stomper. This is a theatre-style venue, so I get to play my original, story songs. The quieter ones and the songs where hearing the lyrics makes a difference (as opposed to the gigs where the job is to keep the dance floor humming and the bar sales rockin'). If you're in the area - or have friends who live over that way - well, you know what to do. Check out gig and TICKET INFO here. Last night I was playing at the ANAF Legion in North Vancouver. It was a typical legion gig. The bartender, Lisa ("You want to remember my name? Think of the Mona Lisa! Well what if I end up calling you Lisa!") is friendlier than most and certainly not a "seen it all, know it all" type. Real sweet in fact. A customer even got her up dancing on "Long Train Running" and you NEVER see a bartender dancing. But anyway, other than that, it's your standard Legion gig. Mix of patrons, usual military stuff on the walls that I never mess with, announcements for meat draws, cigarette smokers complete with heavy coughs in their glory (but restricted to outside only of course. This being 2018 after all). It's like going back in time. And while I find myself saying sometimes, all cool like, to other musicians, "Well it's just a legion gig" and they respond with "Hey a gig's a gig", the fact is I can have just as good a time here as I do in a solo acoustic gig where the audience sits in chairs and listens critically to my original songs. Yesterday morning was when Hawaii thought it was under missile attack and the stories of families panicked and scared really made you think. So between two songs, I forget which ones, and while I was retuning, I said to the forty or so souls in the place, "You know, if we suddenly got word that we had 40 minutes before a a missile was going to hit, I wouldn't want to be doing anything other than what I'm doing right now - making music with friends" and I meant it. Well ok there are a few other situations I can imagine being in that would be just as rewarding, but you get the point. Not every musician feels this way. Carrying off a four-hour gig in a bar, playing mostly covers, is not for everyone. And I've got it down to where I do band gigs like this only a couple of times a month. I've had more than a few sidemen quit on me, all citing the late hours, the drunks, the travel time, or the lonely spouse as reasons for opting for the Netflix life. Not judging, maybe it'll be me one day, but I'm saying I like doing what I'm doing, the way I'm doing it. I like getting to the gig, wherever it is, and setting up my growing pile of gear, making sure it's sounding decent. I like talking to friends who come out to the gigs and talking to regulars. And of course playing. Looking for those nights, sets, songs, moments in songs, where it all flows. Where, collectively, you find the pulse, the groove or the meaning in the music. I love it when this happens. I don't have just one sound or one stage persona and this two-date tour coming up on Vancouver Island early next month is a good case in point. On Friday Feb. 9th, I'll be playing my fourth Rock n Roll Dance Party at Char's Landing in Port Alberni. Classic rock, soulful RnB, swamp rock a la CCR, all that good stuff that gets you moving. This version of the John Pippus Band will include Marq DeSouza (guitar and vocals)and Port Alberni's John Dryden (bass) and Sean Keough (drums). The mission is to keep the dance floor hopping. 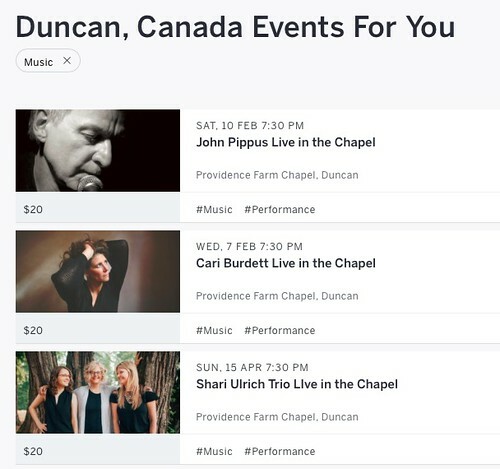 And then the next night, Saturday Feb. 10th, I head down to Duncan to play at The Chapel at Providence Farm. This venue is all about the songs. The audience gets to hear the stories behind the songs, and I get to do tunes from my catalogue that need a theatre setting. I'll be joined by Marq DeSouza on second guitar and percussion. About eleven years ago I wrote a song called "Blurry Photograph". As I was writing it, I was picturing a world weary,love sick and jilted protagonist sitting in a Paris bistro on a rainy afternoon spilling out his heart to his notebook while sipping on a "petit cafe". Or maybe absinthe. Anyway...Good song. Got recorded. Posted to Myspace (I did mention this was awhile ago). One day, it was listened to, by happenstance, by a young woman living in Paris (!) and she sent me a note saying she liked it. Chrystelle has a Lebanese background and you can hear that middle eastern half tone thing in her delivery. I really think she nailed it. I can't tell you what the lyrics say, but I suppose they're similar to my English version, which you can find HERE. Why am I telling you this? Because I'll be performing with a youth choir in March and they're French Immersion students. So I'm looking for a song that would be suitable for their teacher to sing. I hope she'll do "Le Cadre Photo"! Looking back at 2017 I did 51 shows. Eight were solo, six were duo or solo gigs, seven were kids shows (that I do at the Roundhouse Community Centre on Saturday mornings - great fun! ), and thirty shows were with the band. 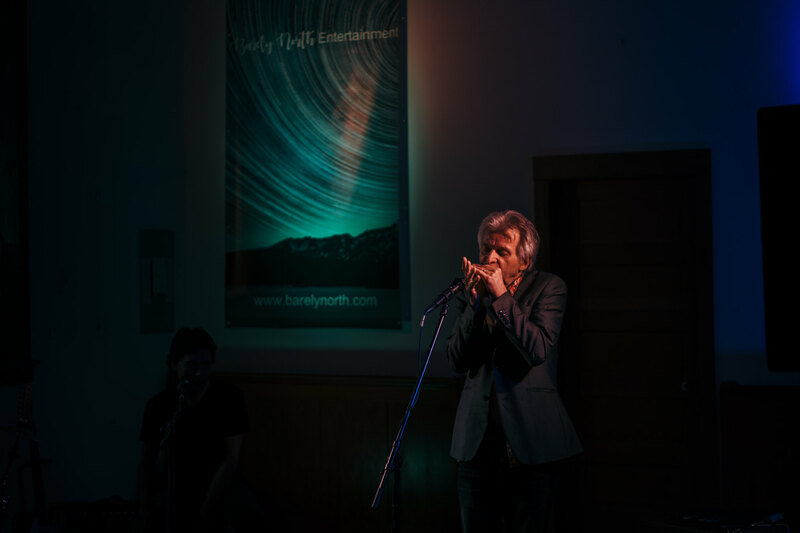 I played three times on Vancouver Island, doing a few shows on each visit. The band played three birthday parties. I played three shows with Beaver T. in November. Peggy and Brice joined me and Wes at a Music BC event as the demo band for how to soundcheck at a live gig. The last show with Peg and Brice was at the end of July. After that, I went through a couple of personnel changes, ending up with the debut of the current line-up at the Libra Room on Dec. 29th. Going into 2018, joining me in the new line-up are: Marq DeSouza (guitar/vocals), Jean Savoie (bass/vocals) and Wes Skakun (drums). In February I released a five-song EP, "Weapons Of Emotion", produced by Brice Tabish. In June, I retired from 11 years of booking and hosting the Friday Music Nights at Trees Coffee House, passing the torch to Marq DeSouza. I also started hosting occasional house concerts, working with SideDoor who book the acts for me. Looking ahead to 2018, I've got several gigs booked with the new band, several solo and duo gigs booked too, around Vancouver and on the Island. In the fall, I'll once again board the VIA rail train and play three sets each day for the passengers in exchange for "room and board". I'll be travelling to Toronto with my fellow Sarnia Boy, David Puzak, where we'll do some shows, writing, and recording before heading back, solo, to Vancouver on the train. It's always fun playing the cover gigs (mixed in with as many originals as I feel I can add to the mix without losing the sometimes distracted bar crowd), but the solo concerts for listening audiences are always the most magical and musically rewarding. The adventure continues. Sign up on my "Connect" page to get my newsletter so you'll know the latest from here.